If you want to give your bedroom walls a makeover, but painting isn’t an option, don’t despair. Whether you rent, or simply don’t have the time, the budget or the desire to use paint, there are still plenty of options for jazzing up your walls without creating a permanent change. Cover all four walls, one wall or just a section of a wall without fear – you can remove every one of these decorating ideas without damaging the surface underneath. Do you love the look of cute country calicos, or sophisticated, high-fashion fabrics? Then why not use your favorite to decorate your bedroom walls? Whether you choose to use an attention-grabbing color or design on one wall or cover all four walls with a more subtle pattern, the process is the same. You start with a lightweight fabric – 100% cotton works best – and use craft starch to adhere it to your walls. It’s an easy project that you can DIY over a weekend. Best of all, when it’s time to move, you simply peel the fabric off the walls and wipe away the starch residue. For detailed directions, check out HGTV’s How to Install a Fabric Feature Wall. Create a crazy-quilt pattern with multiple fabric designs. Make a fabric “headboard” at the top of your bed. Cover your closet doors with fabric. Use solid, soft-colored fabric on three walls, and then go all-out with a bright version of the same color on the fourth wall. Pick two colors of fabric and hang them in a checkerboard pattern. What’s made of rice paper, is self-adhesive yet easily removed with no left-behind residue, and comes in a near-endless range of colors and designs? Japanese washi paper tape, that’s what. With a steady hand and a level, you can use washi tape to create all sorts of designs on your bedroom walls. Lay out a rainbow of stripes, as shown here, or get sophisticated with wider stripes in a burnished metallic or matte black. Liven up a child’s bedroom with cheerful brights spelling out his name, or recreate his favorite action character. You can find washi tape at most craft stores, or purchase it online through Amazon.com or specialty shop Cute Tape. Outline a cityscape in black tape. Write a word or phrase that inspires you. Work tape into geometric designs. Design a simple mural out of washi tape. Not just for kids’ rooms anymore, removable wall decals have really come into their own. You can find pretty much any theme you desire, including quotes, nature scenes, abstracts and sports motifs. Generally, you aren’t going to cover your entire wall with decals, but simply create a design that covers a portion of one or more walls. Highlight your bed with a quote about love, thrill your child with a cloud of colorful butterflies or lay out a more complex scene, like the birch tree winter forest scene from Innovative Stencils shown here. Decorate a wall with birds, butterflies or flowers, and let a few overflow onto the ceiling. Stretch a decal tree across two walls. Finish a children’s bedroom theme with matching decals. Use decals to create a large mural on a portion of one wall, or at the head of the bed. Who said drapes are only for covering windows? Why not use draped fabric to cover a wall instead? It’s a great look that adds a touch of luxury to a bedroom. You can make your own drapes from a favorite fabric, or purchase long drapes in a color that complements your room. This is a decorating option best kept to one accent wall – four draped walls would be too much like a soundproof box. You’ll need to measure carefully for this project because it looks best when the fabric drapes from ceiling to floor. If you’re going to make your own drapes, choose a fabric that has enough weight to drape gracefully, yet isn’t stiff or bulky. Make sure your curtain rods are sturdy enough to hold the fabric without sagging. Create high contrast with dark fabric against white walls or light fabric against dark walls. Use your drapes to hide a damaged or stained wall. Pick a fabric with a bright, cheerful design for a child’s bedroom. Let drapes replace your headboard. In a small bedroom, keep the fabric close in color to the walls. This creates interesting texture without closing in the space. You might think an entire wall of hanging artwork is a look only suited to the living room, but as the room shown here proves, it works beautifully in the bedroom as well. Before picking up the hammer and nails, however, it’s best to lay out your artwork on the floor or bed and rearrange the pictures until the configuration pleases you. The key to a good-looking art wall is to match the pictures in some way. Often, this is accomplished with matching frames, but you can also match the art’s theme, colors or artist. Generally, you’ll want the pictures just a couple of inches apart, and they should all be evenly spaced. Print out your favorite photos, and create a collage or frame the photos separately. If nail-holes are a no-no, use poster putty, double-sided tape or Velcro tabs to hang lightweight artwork. Suggest a collage of favorite posters, photos, and drawings to a teen who wants to liven up his or her bedroom. For art on a budget, take old, interesting maps, cut each into three even sections, frame each section separately, and then hang them on your wall. Now here’s a look that isn’t for the bashful, but what a fun, colorful and unexpected touch for a bedroom. You probably won’t want to cover an entire wall in this way…although if the wall is small enough, and you’re looking for a truly romantic, feminine style, why not? Get the detailed directions for the floral piece shown here at Love Your Room. Instead of gluing the flowers directly to the wall, glue them to a sturdy panel, and then attach that to the wall with small nails or screws. Flower the closet doors, or surround a vanity mirror with flowers. Check out the local dollar store for inexpensive flowers and supplies. For the most romantic vibe, use all red faux roses. For a cottage look, mix up wildflowers. Get country with sunflowers and daisies, or tropical with faux lilies. You can get serene or rustic by using faux foliage instead of flowers. Add a few paper or silk butterflies, bees or birds to your finished design. Wallpaper has come a long way since the days when it was nearly impossible to strip from a wall without the use of chemicals. Today, many manufacturers have lines of removable wallpaper that is easy to install – many are self-adhesive – and just as easy to remove without a bit of damage to the wall underneath. As with traditional wallpaper, you’ll find patterns for every decorating style. The lovely magnolia design shown here is from Murals Your Way. You’ll find lots of full-wall murals, including landscapes, seascapes and close-up photos of natural elements like flowers. 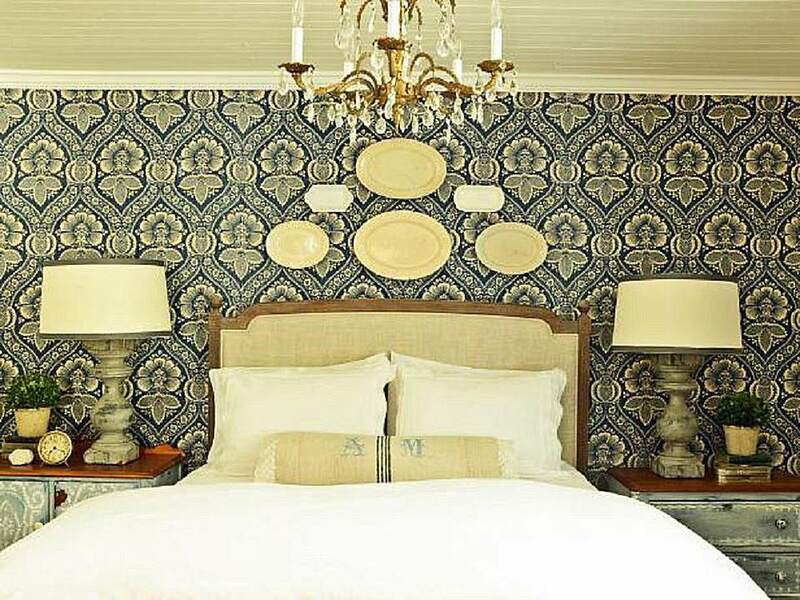 Choose a striking wallpaper design to create an accent wall at the head of the bed. Hang removable wallpaper in a nursery, as it’s easy to switch once the baby gets older. Use removable wallpaper to create a large “picture” on the wall, and then surround it with a frame.